Jazz ScaleHelper is the fast way to improve your playing. With actual feedback based on what you played, Jazz ScaleHelper enables you to concentrate on the aspects of your playing that will help the most. 2. Choose a scale: Choose the exercise you want to play and Jazz ScaleHelper listens and gives you a score. Ideal to improve a specific musical exercise. 3. Challenge me: Jazz ScaleHelper will ask you to play exercises from your challenge list that is based on your chosen syllabus. 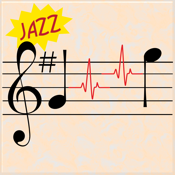 Jazz ScaleHelper will identify what you need to practise and make sure you get exam ready while having fun on the way. Ideal for practising a range of exercises. Jazz ScaleHelper contains everything you need for the instruments covered by the Jazz syllabuses from Trinity Guildhall and ABRSM examining boards. Jazz ScaleHelper will be there for you every step of the way as you grow as a musician. Instruments supported include Violin, Viola, Cello, Guitar, Bass Guitar, Clarinet, Flute, Oboe, Saxophone, Bassoon, Recorder, Trumpet, Cornet, Trombone and Horn. A full list is available at www.jazz.ScaleHelper.com along with details of the rich feature set Jazz ScaleHelper has to offer. At less than the price of a single music lesson the guidance that Jazz ScaleHelper provides between your lessons builds on that teaching. You can dispense with the need to review scales by playing them in your lessons and instead reuse the time you gain to learn technique and perfect your pieces. Jazz ScaleHelper supports multiple users, keeping each user's history for each of their instruments. You can save recordings to study later or to show and play to your teacher and friends. You can also email recordings to share them with others. Have fun competing with your friends to see who can get the highest score or who can maintain the highest average.